"Best snowmobiling in five years," people in the bars were telling me. I wasn't going to argue! While Bobbie was off in the Maui warmth with Lisa, Debbie, and Carole, I jumped at the chance to go snowmobiling with Ryan Blackman, his father-in-law Dennis, and his soon-to-be brother-in-law Al. Good decision since the weather cooperated perfectly to bring snow and leave the area in near ideal conditions! In the past I had only been on some simple, short tourist-oriented snow-mobile trips. I didn't even realize that the locals call it "sledding" instead of snow-mobiling. Over two days we covered nearly 300 miles in the Wisconsin wilderness near Hayward. Bobbie and I had seen the snow-mobilers at the various stops on a road trip before, but we didn't fully appreciate the culture of sledding. At least done properly. As near as I can tell, sledding means taking this light little 100HP+ machines at breathtaking speeds, stopping to drink, and then repeating. 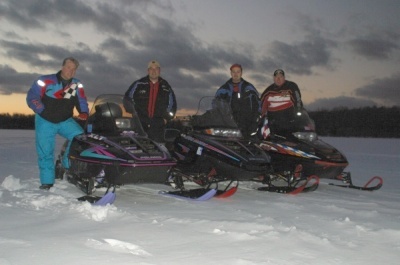 We drove the sleds at over 100MPH down little fire lanes and open lakes and slid them around corners in the dense forest as we brushed mere inches from trees at 40-50MPH on our ways to the various bars. Some of the bars were in the middle of no-where and more than once we were the only ones in the place. At other places, 40-50 sleds would be crammed in as people downed their drinks and made ready for the next trail to hit the next bar. The sledding crew is an interesting bunch. Our trip featured a little bit of everything including a guy who turned down $80,000 for a set of deer antlers, a lesbian kiss, and an honest to goodness bar fight. It was great!! !